One of the cruel ironies of the last minute deal between the Eurogroup and the Greek government for a four month extension to the existing ‘aid’ programme monitored by the Troika is that in any sane meaning it is not aid at all. In return for staying in the Troika programme for another four months to end-June and keeping to the still to be agreed conditions on fiscal targets, government spending and privatisations, the Eurogroup, the ECB and the IMF will disburse the outstanding tranches of loans under the existing programme. The FT might call this “aid” but it is nothing of the kind. It is not even bailout money for Greek banks. The €11bn funding for that has been returned by the Greeks to the Troika who are keeping it for ‘security’. Between the beginning of March and the end of June, the financing institution of the Eurogroup, the EFSF, will release €1.8bn, while the ECB will return profits that it has made on maturing Greek government bonds that it purchased in 2014 worth €1.9bn and the IMF will disburse another €3.6bn in funds under its programme of ‘aid’ that lasts until April 2016. That’s €7.2bn. But most of that will be immediately recycled back to the Troika as repayments of debt and interest for previous loans and government bonds that are maturing. 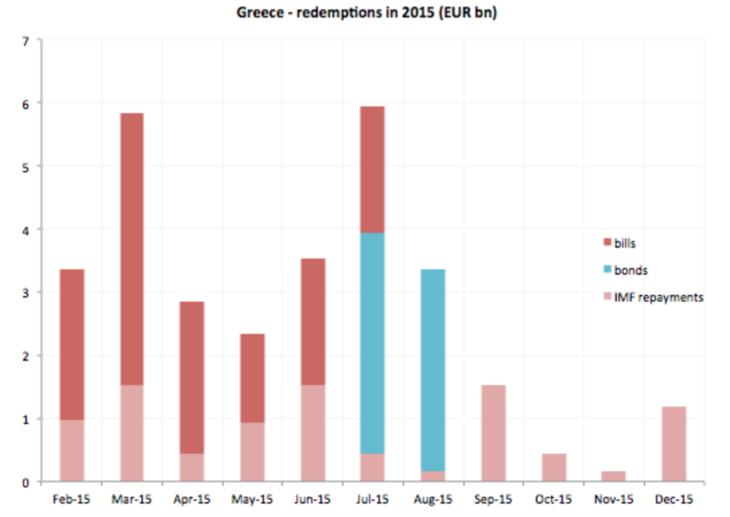 In the upcoming four months, the IMF must be paid back €5.3bn while the Greeks must also roll over short-term T-bills bought by the Greek banks worth about €11bn. So the Troika ‘aid’ will just disappear and the Greek people will see none of it to help with government spending. And what happens after the end of June? Any new programme with the Troika (if that is what Syriza decides to do) will involve yet more repayments, including €6.7bn to be paid back to the ECB on maturing government bonds in July alone, and with more to the IMF. It is never ending. This is just like ‘Third World’ aid that used to be distributed by the World Bank and other international agencies back in the 1980s and 1990s. Most of this ‘aid’ ended up in corrupt dictators’ pockets or in repaying previous debt. The people never saw it. And the debt levels stayed where they were, as they do for Greece now. Back then, eventually the international agencies agreed what was called a Brady debt swap that wrote off a portion of the debt that could never be repaid. No such plan is available to Greece, although Syriza asked for it in their negotiations with the Eurogroup. The debt to the Troika remains fully on the books and, as a share of Greek GDP, is set to rise. Sure, the cost of servicing this debt is relatively low with repayments on the EU part of the loans put off until the next decade and interest on these loans at very low rates. But the debt liability is there forever – like the proverbial albatross on the back.